Hamilton Town Hall is located at 53 East Colonial Highway, Hamilton, VA 20158; phone: 540-338-2811. Photo: William Smith House (Jonas Smith House), ca. 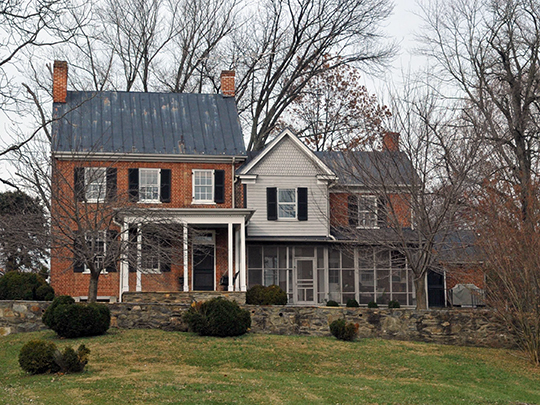 1813, 38678 Piggott Bottom Road, Hamilton, VA. Listed on the National Register of Historic Places in 2003. Photographed by user:Jerrye and Roy Klotz, MD, 2007, (own work) [cc-by-3.0 (creativecommons.org/licenses/by/3.0)], via Wikimedia Commons, accessed January, 2014. Located west of Leesburg on the Leesburg Turnpike, known today as Route 7, the town of Hamilton saw its rise to prominence in the 1860s when the Alexandria, Loudoun and Hampshire Railroad was extended west of Leesburg. In a history of Loudoun County published in 1908, the author remarked that Hamilton was not only "one of the prettiest towns in the county," but was the epicenter "of a group of seven towns and villages within a radius of five miles," and was less than fifty miles by rail from Washington. A publication of Farmers and Merchants National Bank notes that Hamilton was a "Tourist Mecca Around 1915." Recollections of Hamilton by Miss Maizie McFarland paint a picture of the town as a commercial hub. County residents would come to Hamilton to see the county's best doctor, have shoes repaired, horses shod, a clock repaired, hire a nurse, buy a newspaper, or get a book from the library, fill a prescription, get carpentry work done, buy produce, or see the dentist. The Town of Hamilton enjoyed prosperity until March 25, 1926 when downtown Hamilton was the scene of a disastrous fire which destroyed a number of businesses including the local department store, haberdashery, hardware store, pharmacy and mercantile. It also destroyed the post office and a number of the finest homes in town; many of these homes belonging to those that also lost their businesses that day. Only one commercial building was rebuilt in the business district and Hamilton never fully recovered. According to one account, the fire stopped just short of the school that is just doors away from Janney Hill (National Register of Historic Places). Beth Scripps, Frazier Associates, Janney Hill, Loudoun County, Virginia, nomination document, 2004, National Park Service, National Register of Historic Places, Washington, D.C.